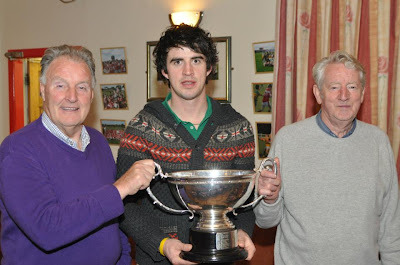 Congratulations to Senior football captain Richie Dalton who was named Offaly senior football player of the year 2011 on Thursday night past. This caps what has been a fantastic year for the Offaly and Edenderry midfielder who has grown into the role of a tremendous leader for this young reds team despite his relative young age of just 24. In the final vs Clara, Richie produced a dominant display where his leadership qualities shown through. He also notched up five of Edenderry's nine points. On behalf of everyone at Edenderry GAA we would like to congratulate Richie on this great honour and hopefully it is the first of many awards he receives.